Poor, lonely and living on the streets, Top Cat is one sad cat, until a chance meeting with Benny, a naive and good-hearted cat looking for adventure. The pair quickly become best buddies and partners in crime - deciding to steal from Mr. Big, a mysterious diamond-stealing henchman who rules New York's backstreets. Along the way, our heroes meet fellow alley cats Choo Choo, Fancy-Fancy and Brain; together they're a formidable bunch. How.. 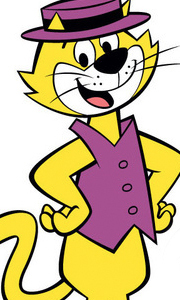 In the tradition of great screen conmen - one of the few with a visible tail - Top Cat holds a top spot in the hearts of cartoon fans. The smooth-talking New York City cat, known as T.C. to his kitty cohorts Benny the Ball, Choo-Choo, Spook, The Brain and Fancy-Fancy, is always on the make toward a big score or swindle. And the bothersome - and ever exasperated - Officer Dibble is relentlessly on his case (although always one step behin..
Benny the Ball, Fancy Fancy, Choo Choo, Spook, Brains and the indisputable leader of the gang TC, are back at war with the long arm of the law when the menacing Police Chief Strickland moves to town. With the help of a bullying robot police force, Strickland threatens to be the most dastardly enemy the gang has ever faced. With their wise-guy lifestyle hanging in the balance, TC and friends are forced to cash in on another of their ni..
Smooth-talking New York City cat 'Top Cat' and his kitty cohorts are on the run, with the bothersome Officer Dibble always on their tails. Episodes: Hawaii Here We Come The Maharajah of Pookajee All That Jazz The $1,000,000 Derby The Violin Player The Missing Heir..
Own Top Cat - Volume 2 DVD from Deff, DVD, Blu-Ray & 4K Video Specialists - Free UK Delivery..
Own Top Cat - Volume 3 DVD from Deff, DVD, Blu-Ray & 4K Video Specialists - Free UK Delivery..
Smooth-talking New York City cat 'Top Cat' and his kitty cohorts are on the run, with the bothersome Officer Dibble always on their tails. Episodes: 1. The Grand Tour 2. The Golden Fleecing 3. Space Monkey 4. The Late T.C. Commentary by Animation Historian Jerry Beck, Writer / Animation Historian Earl Kress, Writer / Animation Historian Mark Evanier and Leo de Lyon, the Voice of Spook and The Brain 5. Dibbles Birthday 6. Choo-Choo Goes..
Own Top Cat - Volume 5 DVD from Deff, DVD, Blu-Ray & 4K Video Specialists - Free UK Delivery..